October is (among other things) National Cat Month. It's a time for all us cat lovers to celebrate what we love about our cats. These are my guys, sleeping under the 200 watt light bulb in Mr. L.'s office. They love it there. They don't, however, love each other. It's only because they're asleep that there's no hissing or growling. I think (secretly) they all wish they were only cats. Yes, having cats isn't all fun. Take what happened to me last week as an example. There I was, sound asleep at 12:09 am. But at 12:10, I was jolted awake by the sound of a cat retching in my ear. 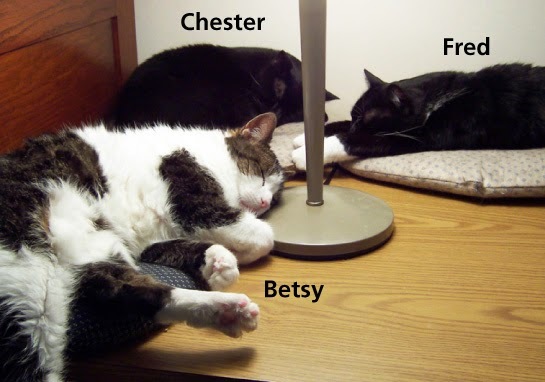 I quickly turned on light just as Mr. L's cat, Chester, projectile vomited ALLLLLL over the bed and on other our other cat Betsy, who'd also been sound asleep. I quickly grabbed Chester in time for second of three barfs. (Yes, in our house barfing comes in threes.) I leapt out of bed and deposited Chester on the hardwood floor (not bedside rug). While he finished his next two rounds of vomiting, I grabbed a large wad of tissues from the bedside box and started to mop up. Betsy was still sitting on the bed looking bewildered. Mr. L was foggy, like he didn't know what the heck was going on. Once the bed is made, Mr. L gets back in and promptly goes back to sleep. But my work is not done. Oh, no. First I must empty the wastebasket full of vomity tissues. Next, I hunt down Betsy, who still has vomit all over her tail. I capture her and commence to wash her off. Betsy does not appreciate this and screams bloody murder, then runs away in fear and anger. Finally, at about 25 after, I get to go back to bed. Chester is already back in bed, cuddled next to his sleeping dad, and looking happy and satisfied, while I must resist the urge to scream at him for fear of waking up the neighbors. I had to read for almost an hour before Betsy forgot the tail-washing incident and came back to bed. Meanwhile in the back of my mind was the mantra I've repeated many, many times. I love cats. I love cats. I love cats. Surely, I'm not the only one with a story like this to share. I hope you'll leave YOUR story in the comments and we can all commiserate. Oh yes, I have had to repeat that mantra a time or two, just so I didn't forget that "I love cats". I always thought that if they made an alarm clock with the sound of a cat throwing up or "hocking" up a hairball, no one would ever oversleep, You can be in a deep sleep, but that sound will have you out of bed and on your feet in a millisecond. Probably my biggest cat disaster happened with on of my foster mothers, who went into heat when her babies were only 14 days old, and totally lost her mind. She decided to escape and party with the neighborhood boys. I thought I had the room secured, but she tore the curtain rod out of the wall (must have learned that from my cats), tore through a shade I had tacked around the window, got through an opening in the window that I was sure no one could get through, and ripped through the window screen and an outer sun screen. That left me to hand feed her babies every two hours (while I was planning a funeral for my dad's companion). Momma came back 5 days later - with her milk dried up (so I had to keep feeding her babies) and pregnant. I briefly questioned the merits of fostering at that point, but - fortunately - it didn't deter me, and I have fostered many other cats and kittens since because "I LOVE CATS"
When Mint was much younger and hunting, there was the time she hoicked up, over the doona, the rodent entrails. Sorry if anyone is eating while reading this, it was the grossest thing I have had to clean up in the way of animal barf, except for when the dog........but that is for another day. We were cat sitting a relative's mama cat and her four kittens for a week and during that time they were not allowed out of the house. When their family came to get them, two stayed home with us. I don't know how one got out of the house, just that I noticed him disappearing over the back wall and I went chasing after him. Let me tell you about our back wall. We have a swimming pool. Because the houses behind us are higher, we also have retaining walls. It starts at the water level, there is a 3 foot wall to the walkway around the back half of the pool. Then a 4 foot planter wall with the back wall which is eight feel. I grabbed a chair to help me up to the planter and was calling the cat over the 8 foot wall. No, I didn't reach. No, I didn't know for sure what I was doing. Yes, I'm still not sure what I was thinking. I gave up calling the cat and stepped off the planter wall onto the chair. . . . the plastic chair that had been sitting out in the sun for a couple of years. Yes, my foot went through and I fell back. I'm lucky I only grazed the pool wall with my back and didn't hit the walkway with my head. I did land in the pool with a chair stuck to my leg, not knowing for sure which way was up. After a brief moment of panic I just let myself sink figuring I'd hit bottom with only one way to go. It worked and I was able to make it up and to the steps. My husband caught me in the pool but not the fall and came out with a towel while I was trying to get the chair off my leg. I'm crying, I'm hurt, and I'm a little mad at the cat so it took me a bit to finally see some humor in the incident. As I'm drying off and explaining why I'm in the pool, the cat pops over the top of the wall and comes home as if nothing is wrong. Because, you know, nothing is for him. Lynda, I'm always in awe of how many cats and kittens you foster. It takes a strong person to love these cats and then let them go to their forever homes. Thank you for making it possible for so many cats to have happy homes. LOL -- but *sudder* at the same time. Yes, another opportunity to grit your teeth and repeat over and over again, "I love cats...I love cats...I love cats." My Bessie did it the night before last. Usually in the bedroom and then down the hall into the living room. She does it three or four times but not in the bed so far. What I want to know, is why do they always vomit at night? Is it to get even with us for something we didn't do for them during the day? I hope not as I try to do everything she wants me to do. Yes she is spoiled! There are so many stories from over the years. The year one cat got hold of some curly gift ribbon from God knows where, I'm so careful with it, and had to pull it out from his behind, thankfully he was able to pass it and there was no blockage. The systematic destroying of all my non-poisonous house plants and subsequent puking. My 19yo cat just passed away on 9/29 and he was such a puker. I have 6 comforters and at any time 5 of them would be at the dry cleaners trying to get the puke out. My couches are destroyed. and then there is what we call the "morning slide", stepping in vomit you don't see first thing in the morning. He had kidney disease for a couple of years and I gave him subQ fluids up to 2x daily towards the end, getting up at 4am, and I wouldn't have traded one second of it to have him back. I still have 2 cats left, 10yo siblings that act like an old married couple. What do I do, people think you're crazy, but I love my cats. also funny about your cats lying under the light, my cat Maggie sits on my nightstand and sticks her entire head into the lampshade. all you can see is her shoulders down. It's a riot to see, like the leg lamp in the Christmas Story. I think I'll get her a 100watt bulb as a Christmas present. No cats, only the disgustingly similar story about the dog which I will save for dog week someday. But the spirit is the same, just have to keep looking in that little face and thinking I love you, I love you, I love you. Such a timely as I was cleaning up several piles of recreational puking myself! This was while listening to various hisses as the three disagreed about who should puke next! Ah the dreaded Night Barf. We proud parent of cat-dogs (as I think of Daisy the Dachshund) know it well. Daisy also sneezes. Don't ask for details. We do love them and they repay us a thousand fold. Right now, I only have dogs, and the following is not exactly why that is true. We had two cats who loved one another and liked to play chasing games in the middle of the night. They were playing chase around the bed, and across the bed (at the time I was sharing the bed with my husband, he moved on to younger pastures and I now share nothing with him). Anyhow, I shouted at them to stop - they did not (yes, I could have gotten up and shut the door, but they would then bang on it until it was opened.) About the 4th trip across the bed, I picked up a shoe from the floor, threw it in the general direction of the sound of pounding cat feet, and it went through a window- there was glass - a very cold breeze - and everyone in the room was very shocked. I've awakened several times to kittens or cats barfing or peeing on my blankets while I was asleep. I grumble and curse a lot, take a bath or shower, and remake the bed. Good times... But I really do love cats. First of all, thank you all for morning chuckles---gross but funny. One of my cats (Spats, the only one left) has always loved to eat plastic. One day when a guy came to finish installing the new furnace, he set his metal tool kit down in the hall. I looked down and thought "I need to tell him to cover up the blue electrical tape" but was talking about something else and forgot. He was here for an hour or so and the minute his truck pulled out of the driveway, Spats was in the living room barfing up blue tape. At least it was on the Pergo floor instead of the carpet and was easy to spot! I was having some church ladies over for dinner and had the dining room table decked all out in china, silverware and flowers. All four ladies arrived, and I ushered them into the dining room. There my tuxedo cat, Sherlock, was curled up asleep on one of the Royal Albert dinner plates! Another time, these same four ladies came again to dinner, and one of the ladies sat down at her place and made a face. She stood up and squealed--she'd sat down on a large hairball, etc in her winter white corduroy skirt. Sherlock, again! Then another time, she reached for her large purse and yes, Sherlock was curled up asleep in it!! Chester pukes night and day. You never know when he's going to hit. Just glad I have brown rugs. I'm so sorry your lost your kitty. Yes, we get fed up cleaning up after them, but losing them is far, far worse. yes her again, will just shove her face into the flame, her whiskers are rather stunted in consequence. But she never learns. I feel your pain, Stephanie. Sneezes? Yikes! But then there's also the dreaded HEAD SHAKE. Where the cat stands RIGHT BY MY HEAD in the middle of the night and shakes his/her head and all the spit goes FLYING ON MY FACE. Yes, almost but not quite as bad. Oh my! Funny in retrospect, but I'll bet it was not at the time. Never had to take a shower after a late-night barf, but washing hands and feet has happened wayyyyy too many times. Our cats are drawn like magnets to Easter grass. It is banned from my house, but sometimes it appears as if from out of nowhere. (Usually hidden in some yard sale purchase.) It's not pretty what happens next. Feeling your pain... Why is it cats NEVER throw up on the vinyl or wood flooring that would be easier to clean? I had a cat start to hack, walk, hack, all the way to the rug-that-is-hard-to-clean, they only run downstairs!